At what point does energy storage become viable? At What Point Will Small-Scale Solar Energy Storage Become Viable? Energy storage is a hot topic in the cleantech sector, as the technology quickly moves closer and closer to financial viability. Lux Research anticipates that the residential market will lead the way in uptake, riding on the shoulders of rooftop solar PV’s phenomenal growth globally. If the dance between the winding back of government and utility incentives for small-scale solar power and the falling price point of energy storage continues without a stumble in the US, Europe, and countries elsewhere, the country will see energy storage smoothly coming in to pick up where feed-in tariffs and 1-for-1 net metering leave off. Feed-in tariffs have been drastically wound back in European countries such as Germany and the UK over the past few years as the cost of solar PV installations has come down. In Australia (whose solar scene I am very familiar with), the closure of South Australia’s transitional FiT last month marked the end of an era: it was the last state-based feed-in tariff system that helped to turn the country into a solar powerhouse (relative to its population size, anyhow). Now, in the US, net metering for residential solar is under threat as solar panels make their way into the mainstream and bring challenges to the conventional business model of utilities. Solar power: To export or to self-consume? 3) The reward for exporting solar power is less than the value of retail electricity, or the amount is nominal or non-existent. Situation 1 favors export. In situation 2, it doesn’t matter whether the solar system owner exports or self-consumes: the financial reward is the same. In situation 3, self-consumption of the solar power is the best way to make it worthwhile economically for the owner. This is not necessarily the end of the world for solar. Australian states like New South Wales, where the state’s generous Solar Bonus feed-in tariff scheme was scrapped and replaced with essentially nothing (some utilities volunteer 6c/kWh for solar — vs retail electricity prices in the mid- to high-20c range), people have been finding ways to make it worth their while, and the market for solar has more or less stabilized. The golden rule for all of these newly solar-powered homes, however, is self-consumption: use the solar power that your system generates as it is being generated — while the sun is shining. This clearly limits the residential market for solar power primarily to households and businesses occupied or running appliances during the day; the same would be true in the US if 1-for-1 net metering is shut down in all the places it is currently available. Energy storage has the power to change that by allowing solar-powered homes and businesses to save their solar power for later. Of course, unless someone has it out for the utilities so much that their goal is simply to become (virtually) energy independent, the most likely goal of installing an energy storage unit would be to save money on power bills. How far off are we from that being an option? The cost of solar panels, according to Cost of Solar with GTM Research and the SEIA. Let’s take the example of someone is looking for a 7 kilowatt (kW) solar power system in Hartford. Below are some inputs that we can use to estimate payback and return on investment (ROI) for such a system in Hartford, CT.
Price: Solar panel systems are still not as inexpensive in the US as they are in Australia, but they’re coming down swiftly and significantly. The Solar Energy Industries Association (SEIA) and GTM Research indicated in a recent report that the average residential install in the US costs around $4.81 per watt. I’ll assume a slightly lower-than-average price of about $4/W–about $1 above the lowest currently available in the US. This would bring the cost of our imaginary 7kW system to $28,000. Cost of electricity: According to the EIA, the average cost per kWh of electricity in Connecticut in July 2013 was about 17 cents. This, of course, could potentially rise in the future (and if it did, this would only boost the case for self-consumption). Reward for electricity export: Connecticut utilities currently pay 17c/kWh for solar power exported to the grid through net metering, which would ordinarily mean a payback period of under 7 years and a return on investment over 15% for our system (if everything goes well). For this situation, however, I’m going to assume a scenario where utilities pay only 6c/kWh. Percent of self-consumption vs export: With this new 6c/kWh rate and 50% self-consumption, the system would not pay itself off for closer to 10 years, but ROI would still be nearly 10%. Up the self-consumption rate to 80% (actually not particularly easy to achieve without concerted effort on the part of the household/business), and it would take just under 8 years for the system to pay itself off, with an ROI of almost 13%. There are many ways to change the variables, and a number of things are likely to change as time goes on to alter the dynamics. In particular, we’re likely to see energy storage costs come down. We’re also likely to see electricity prices go up. Solar PV system prices will also come down, but incentives may also be yanked back. Let’s say the incentives stay in place, the post-incentive price of the 7kW system is $8,000, 3kWh of energy storage costs $900 ($300/kWh), using this the system owner achieves 80% self-consumption, and electricity rises to 25c/kWh. This would result in a payback period of just under 6 years, with an annual ROI close to 20%. 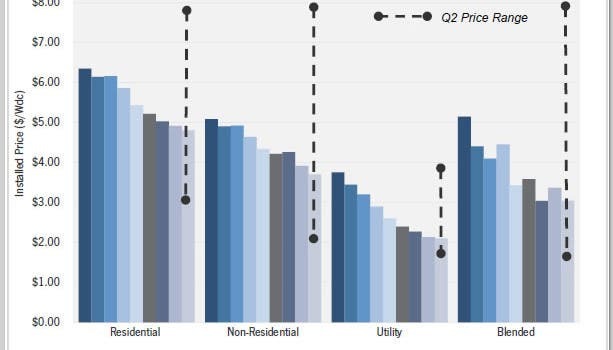 To wrap up — we’re still a ways away from the financial viability of grid-connect energy storage for solar PV for anyone looking to purchase their system outright, but we’re on the cusp. And if more companies like New Zealand innovators Vector come into play, it wouldn’t be surprising to see energy storage uptake accelerate like solar PV’s did when solar leases were first introduced. (As noted above, I’m relatively new to how incentives work in the US, so I’m open to corrections with regard to my calculations.) This post was supported by AGL Solar. James Martin II James is the communications manager for Australian rooftop solar & battery comparison service Solar Choice. He lives in Newcastle, NSW in a house with two solar PV systems and three energy monitoring systems.